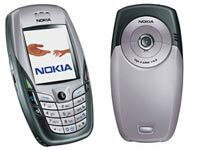 So, yeah, the Nokia 6600, as I said I’d review three months ago. I got a blemished secondhand unit from an eBay seller, and it arrived in pretty good condition, only mildly scuffed. Since then I’ve found it to be an excellent mobile phone and a passable personal organizer. Let’s start with the good. It’s an acceptable combo device. In addition to its cellphone functions, the 6600 is an organizer and handheld computer. It has calendar, to-do list, and notepad applications, and the Series 60 Symbian OS means you can install software, all for half the price of a Treo 650. The Series 60 interface, though a bit more complex than it used to be, is still superior, and I still find it one of the most user-friendly interfaces by far, especially with regard to quick and easy text messaging. I can copy and paste text! Now this surprised me; I thought that by getting a device with a numeric keypad rather than a stylus or keyboard, I’d necessarily be sacrificing the ability to highlight text, but there’s a little text-functions button on the side of the keypad which, when held down with the joystick, will select blocks of text and copy and paste them within a document or between applications, just like any word processor. The camera is pretty decent for its size. Though limited to 640 x 480 pixels, the photo quality is a lot better than the camera on my old Zire 71, and faster. Bluetooth! This is my first bluetooth-enabled gadget, and I still haven’t gotten over the enthrallment of being able to sync with my iBook and transfer files from up to ten feet away. It’s wide. The first thing you notice when you hold the 6600 is that it takes up a lot more horizontal space than an average cellphone, though not as much as a Palm. Still, it’s narrower than the old Globe Telecom Bosch 608 “pancake” I used to have in Manila. The keys are very small and close together, without space between them, often making for difficult texting. At the start, I made a lot of “fat-finger” SMS typos, even with my thin, pointed fingers. Having the keys all scrunched up at the bottom makes lots of space for a giant screen, at least. Some buttons are in strange places, as the 6600 came at a time when Nokia was experimenting with weird keyboard layouts. It’s rather non-intuitive to have the Call, End, Clear, and Menu buttons practically on the sides of the phone rather than in front where they should be. Again, that makes space for the giant screen. I guess I should be thankful this doesn’t have the “combined butterfly” keypad of the 2300, or the “rotary” layout of the 3650. Or worse, I could be sidetalking. Horrors. Image management isn’t so great. Image sizes are limited to 640 x 480 pixels, and cannot be resized down, nor can the camera resolution be changed. (This, by the way, is why I can’t post mobile photos to my weblog right now, as the full size image breaks the layout, and Flickr does not yet, to my knowledge, resize photos posted via email-to-blog.) Images can be rotated while viewing in Gallery mode, but the rotation is not saved. I also have issues with being able to rename image filenames to any length, but having them truncated to 8 characters when sending them via MMS or email — which is why my mobile photo titles on Flickr are never more than 8 characters long. There isn’t a whole lot of free software out there. You’d think that such a popular Linux-based phone would have an active following of open source developers, but I’m just not seeing that much activity on the free software front. There are a few quality free applications out there, though. Perhaps I just haven’t looked hard enough. All in all, I’m happy with this phone and its Nokia-driven advantages. The Nokia-driven quirks took some getting used to, but they weren’t deal breakers. By this time, the 6600 is an old, outdated model, supplanted elsewhere by faster, sleeker designs, but for now, it serves all the needs I have for a cellphone/combo device: calls, text messages, mobile photos, and personal data organization. This should have been my cellphone ever since it showed up here (the first time) back home in the Philippines. But it never happened. And too many people here have the same unit. I always wanted a phone that stand out from the rest. I’m getting the 6680, which is the newer looks less stupid version. I’ll let you know how it goes, but I’m sure it’ll be wonderful. Anything’s better than my Sony Ericsson phone.